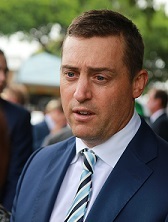 Leading Brisbane trainer Tony Gollan is not being intimidated by a pair of hot favourites opposing his Golden Slipper hopefuls Ef Troop and Outback Barbie at Randwick on Saturday. Both youngsters are second favourite with TAB for their respective races with Ef Troop ($6) out to down Performer ($1.90) in the Group 2 $300,000 UNSW Todman Stakes (1200m) and Outback Barbie ($7.50) up against $1.35 shot Estijaab in the Group 2 $300,000 Reisling Stakes (1200m). Gollan said he’s long thought both were genuine Slipper contenders and if they are then he expects them to put up a fight. “I guess I get to see where they fit,’’ Gollan said. “I had an eye to go to these races before the Magic Millions, it hasn’t been an afterthought it has all been planned. Ef Troop was responsible for setting a hectic tempo in the Magic Millions, where Matthew McGillvray’s ride cost him a stint on the sidelines, and he knocked up to finish fourth behind Sunlight with Outback Barbie running on from the back into third. Gollan said he’s been doing quite a bit of work with Ef Troop to ensure he’s less of a loose cannon in the Todman Stakes. “It’s important when he gets into better races that he can absorb a bit more pressure and be more than a one trick pony,’’ Gollan said. “If they want to go really quick I wouldn’t mind taking a sit, if not he will bowl along at a good rhythm. “A wide gate and less than desirable run brought him undone in the Magic Millions. Ef Troop had three weeks off after the Gold Coast and reappeared on March 1 in a 1000m trial at the same track where he sat outside the leader before working clear. “He wasn’t asked to do a lot in his trial, it was more about getting him to settle and not want to charge too much,’’ he said. “I thought he did that quite well, he wasn’t perfect but better than he’s been. Outback Barbie also trialled on the same day as Ef Troop and she ran superior time and opened up a larger margin than the colt but Gollan said she needed the hitout more. How she measures up against Estijaab, second favourite for the Slipper, will tell Gollan plenty because he’s seen a lot more of Magic Millions winner Sunlight than most people and has a healthy opinion of her. Two weeks ago Sunlight ran down Estijaab to win the Silver Slipper Stakes at Rosehill. “Her trial, although being asked to do a little bit more, was very good and she’s an improving filly and I think she has improved a lot since the Magic Millions,’’ he said. “She got herself into an awkward spot and she ran well. Barrier eight is not ideal but she has more gate speed than what you saw Magic Millions day. “Estijaab’s only had the two starts so there’s no doubt improvement in her. “I had a lot to do with Sunlight, she stayed at our stables during the summer. I saw her a lot more than I would have liked. Ef Troop is currently a $26 chance in the Golden Slipper while Outback Barbie is at $51. Corey Brown rides both youngsters at Randwick on Saturday. Interestingly, the past two Golden Slipper winners were beaten on this day in their respective years – She Will Reign by Frolic in last year’s Reisling and Capitalist by Kiss And Make Up in the 2016 Todman.